Ghost. To what I shall unfold. 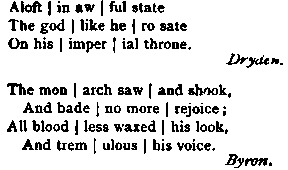 This octosyllabic measure, which is of danger�ously easy construction, and very apt to degenerate into sing-song, has been largely used by our poets of later times. In it are composed Butler's Hudi-braSy Scott's Martnton, &c., Burns's Tarn OShanter, Tennyson's In Memortam, and numerous poems by Shelley, Byron, Wordsworth, Coleridge, &c.
* Abbott! "Shakiparian Grammar," p. 403.